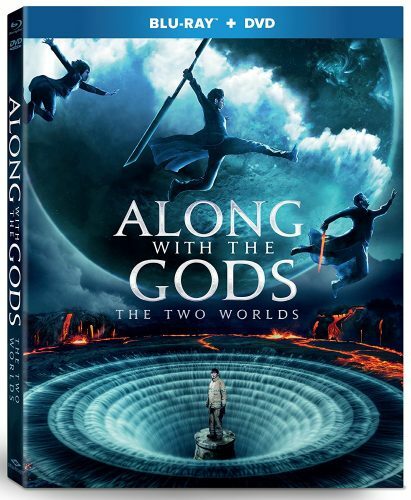 Along with the Gods: Two Worlds is a Fantasy Action Drama dealing with the Afterlife. Are Lead whom we learn throughout the film is a great guy but with a few things in life he regrets. Ja-Hong was killed saving a life from a fire and is taking to the afterlife world where he as to go trough 7 trials to showcase if he is worthy of reincarnation. He is given three grim reaper escorts who have to defend him in the trials. We have a few hiccups along the way including the main reaper whom has to go back to the real world to take care a few things that are getting in the way. Does are lead make it through all 7 trials? Was he really a great person when he was alive? The story sounds odd as it deals with the afterlife but I have to say for me its a breath of fresh air. Concept alone was interesting all the way through. The film has about everything. Some Comedy, some action, and a few moments where you might throw down some tears….I Did. Now it’s not a big action film but it does have some but mainly its a film about life. Acting wise it was great and with its heavy CGI look I have to say its great. Nothing looks cartoony and its pretty realistic. Overall I enjoyed the film a lot. I went in not knowing anything about out and from the start it had my attention. The run time is a little long at over two hours but I didn’t notice as I lost myself in the film. The film is also a two parter, as it was supposed to be one film but it’s so long it was split up and we should be seeing the next installment maybe beginning of next year. The film gets good reviews but also I’ve seen a few bad ones. But for me its the rating is gonna be pretty high. Lets not forget this film is South Korea’s second most viewed film in SK History. With that said I have to give this film a 4.5 out of 5. Most likely will re-watch this when the other part releases. Go Pick it up, enjoy and even have a nice little cry.